Marketing budgets revised up to the highest rate in over two years as marketers hold nerve in face of Brexit uncertainty, reveals the IPA Bellwether report Q3 2016, released this Wednesday (11 October). Despite positive revisions to budgets, the uncertain economic and political climate had a noticeable impact on financial prospects during the third quarter of 2016. Industry financial prospects remained negative, with the net balance falling to -12.1%. That is down from -8.1% and the third successive reading below zero (meaning a greater proportion of panellists have become more pessimistic than optimistic over the past three months). This was the lowest recorded by the survey since Q4 2012. Panellists were, however, a little more optimistic about their own company financial prospects during Q3. Over 31% of panellists have grown more optimistic, compared to less than 21% that indicated a more pessimistic tone, resulting in a net balance of +10.6%. However, that was down from +13.7% in the previous quarter and the lowest recorded by the survey since Q4 2012. Around 20% of the survey panel indicated an increase in internet marketing budgets, compared to just short of 11% that signalled a fall. As a result, internet budgets continued to rise during the third quarter to +9.5% during the quarter. This marks over seven years of upwards revisions, although this was slightly lower than Q2’s +10.9%. Within internet, Search/SEO recorded a net balance of +7.3% for Q3, but Mobile posted -2.6% (this is the first time Bellwether has reported mobile as a subsection). 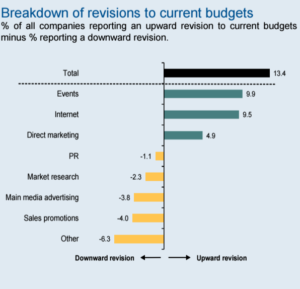 Direct marketing budgets were also revised up, recording a reading of +4.9%, the highest level for a year-and-a-half. 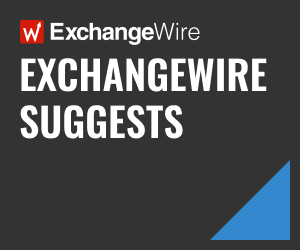 ExchangeWire spoke exclusively to some of the online advertising industry’s top thought leaders about what the latest report means. Richard Robinson, MD EMEA, Turn highlights that to maximise their increased digital media spend, brands need to focus on an omnichannel approach: “It is promising to see that brands are continuing to increase their budgets in the ‘internet categories’. However, as competition for consumer attention increases with spend, identifying and engaging with customers using data will be critical. “It’s no longer good enough for brands to utilise data insights from single channels. As consumers increasingly demand more personalised, relevant and timely ads which resonate, brands need to cater to this and draw together and connect insights across multiple devices. Being targeted by brands with the same message across devices and channels is annoying and boring for consumers and a waste of money for brands. Tom Bailey, EMEA VP, Marin Software, also sees the need for a cross-channel approach: “It’s encouraging to see marketing budgets predicted to increase yet again, especially in the wake of uncertainty around Brexit. But, while it’s no surprise to see continued growth in online advertising investment, the question is whether growth can be sustained when cross-device habits make targeting harder than ever. Antoine de Kermel, MD EMEA, TVTY, says tightening budgets for the year ahead will drive marketers to look for better value from their ads: “The IPA Bellwether report gives us a unique look into not only the advertising industry, but also the wider feelings of the UK. The political fallout of Brexit has clearly hit industry confidence hard, but it appears the English resolve holds strong. Nearly a third (31%) of respondents have grown more positive about their own company financial performances. “With budgets set to shrink in 2017, we expect there will be greater scrutiny and further emphasis on marketers to get more bang for their buck. To perform under this pressure, marketers will have to target the moments that have the greatest impact on their customers. Theo Theodorou, EMEA MD, xAd, thinks innovation in measurement techniques is driving growth in digital media spend: “Brands are continuing to increase their budgets in the ‘internet categories’ not only because consumers are using these channels regularly, but also because they have the potential to be more easily measured. “Looking at location, for instance, brands are able to measure the link between mobile campaign delivery and in-store visitation to understand how mobile is driving actual foot traffic into their stores. Recently, comScore have partnered with xAd to create a measurement framework to help brands do this. Putting this third-party validation in place means brands can effectively quantify the value of online advertising on offline sales. Industry education is to thank for the strong performance, according to Paul Nasse, commercial director, Integral Ad Science: “Much of the coverage following Brexit has focused on the doom and gloom so it is refreshing to see positive revisions in the Q3 2016 IPA Bellwether marketing budget forecasts. This outlook certainly echoes the sentiment from our H1 2016 Media Quality Report, which shows a narrowing gap between the quality and performance of direct and programmatic trading. A focus on increased education across the industry is helping to raise awareness of opportunities to further improve advertising performance. Will Bishop, UK country manager, ADventori, is still cautious of threats, despite these positive results. He said: “This is the first set of Bellwether figures collected after the EU referendum result and it seems that the pre-referendum fears around a big marketing slow down have been proved wrong. “But, while the immediate danger seems to have passed, our industry cannot become complacent. There are still significant threats down the road. Ad blocking is one, but a drop in trust from media agencies is certainly another worrying trend. Research from OpenX and ExchangeWire in September showed a drop in trust in programmatic ROI and the recent Facebook video viewability controversy will not help either. “If the digital sector is to maintain its increasingly dominant position in the marketing mix, our industry not only needs to work harder to deliver better targeted and more relevant campaigns to consumers, but to think about developing more transparent and nuanced measurement techniques to demonstrate the increased ROI for this approach back. “For example, when we deliver a personalised dynamic ad campaign, marketers need a viewability metric that gives them reassurance that not only has the ad been seen, but the dynamic message has been viewable as well.